What is Albanian Food, Anyway? As with everything else when we started planning our trip to Albania, the idea of Albanian food was a big question mark in our minds. For no good reason, our expectations weren’t high, but we assumed we would make the best of whatever we were faced with. And, if that didn’t work, I had protein bars in my bag. 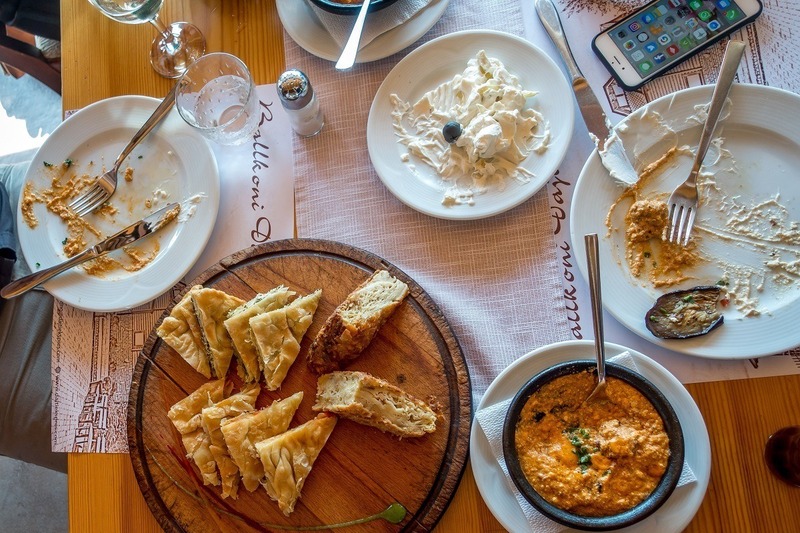 Albanian cuisine was influenced by Greek, Italian, and Turkish cuisine, but also influenced the food traditions of its neighbors. Albanian food is fresh, flavorful, varied, and sinfully cheap. With seafood, feta cheese, tons of vegetables, and the herbs of the Mediterranean, there is everything to love about the culinary options in Albania. 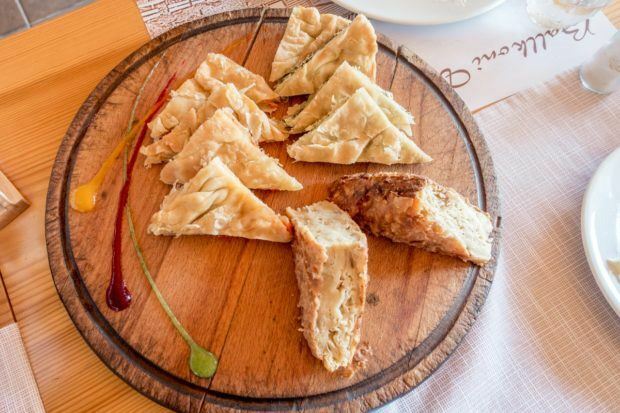 Here’s a look at some of the great foods (and one drink) you can’t miss on a trip to Albania. A filling side dish, fergese was one of our favorite Albanian dishes. 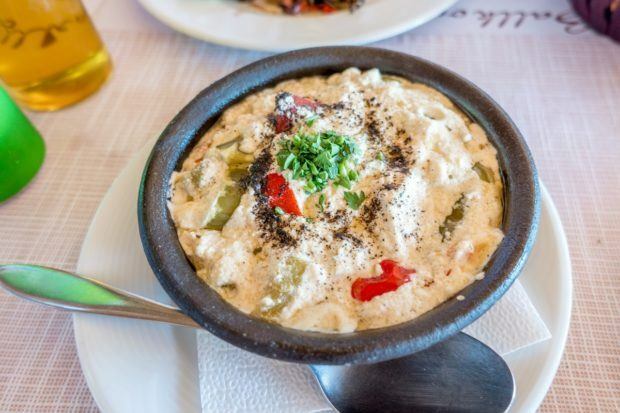 The vegetarian version (Fergesë e Tiranës me piperka) is made with peppers, tomato, egg, and curd cheese (similar to cottage cheese). Everything is mixed together, warmed, and served with bread. Pretty damn delicious. Fergese me melçi is a similar dish that becomes a bit more like a casserole because it includes liver. 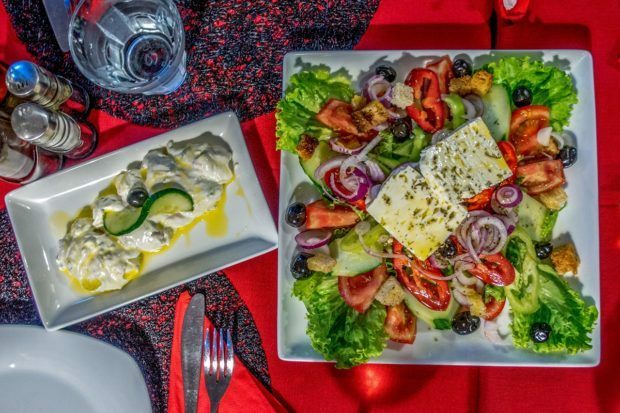 Albanian food–like many cuisines–is heavily influenced by its past. 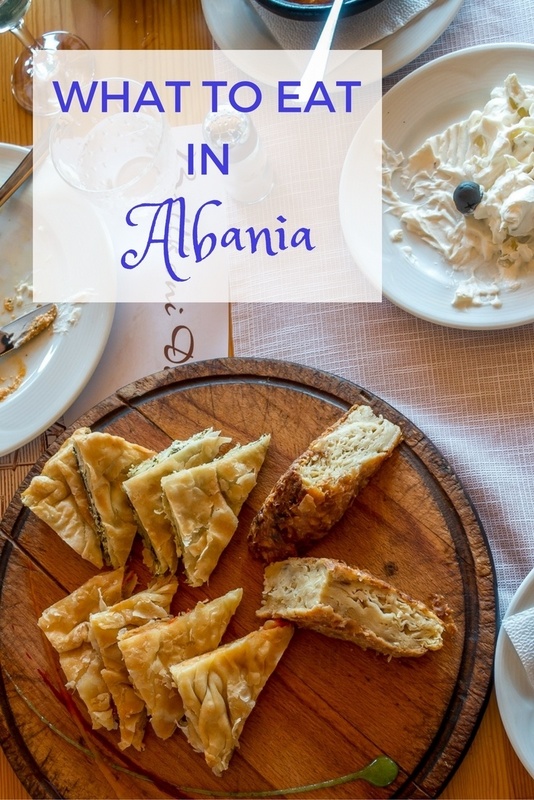 The area that is now Albania was once home to Greek tribes, and parts of Greece are only about 20 miles from the Albania coast, so it makes sense that there would be a fair amount of culinary overlap. Many things we might think of as Greek food (usually Ottoman or immigrant-influenced) have a very close cousin in Albania. 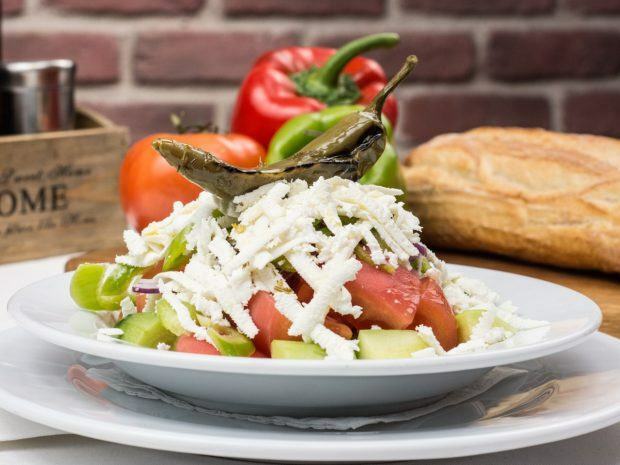 The Aegean salad we frequently had in Albania was the same as any “Greek” salad you might find around the world—cucumbers, tomatoes, olives, and a feta-like cheese, topped with vinegar and olive oil. The sweet, flaky, nutty baklava was the same, too, thanks to the influence of the Ottomans. We also discovered tarator, a dish similar to Greek tzatziki. Made of yogurt, garlic, parsley, cucumber, and olive oil, the refreshing dish is served cold, often with bread. We made it a point to have tarator as often as possible. A savory pie with layers of flaky phyllo goodness is perfect pretty much any time of day. In Albania, burek (also byrek or borek) is a triangular pie filled with salty cheese, spinach, cabbage, meat, or some combination of those. Burek and similar dishes are found in lots of countries that were formerly part of the Ottoman Empire. Think of it like Greek spanakopita with a larger variety of fillings. Because I’m picky about meat, burek became my go-to dish in Albania because I knew that even the vegetarian version would be good and filling. Burek was on the menu of most every restaurant, but it’s also a popular street food item especially from vendors called “Byrektore” that sell it by the slice. Albania’s entire west coast—all 200 miles of it—borders the Adriatic sea. That means that there’s tons of opportunity to get amazing seafood. 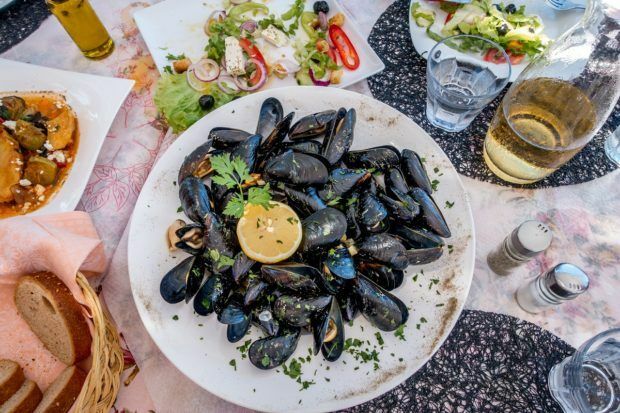 During our stops along the Albanian Riviera, we tried mussels, shrimp, and fish, and the best grilled octopus I’ve ever had. And it was all fresh, expertly prepared, and absurdly cheap. Served with a bit of Albanian wine, it couldn’t have been more perfect. The national dish of Albania, tavë kosi is a baked dish of lamb, rice, yogurt, and eggs. Cooked in a casserole dish, it emerges with a texture similar to a creamy quiche. The name translates to “soured milk casserole,” but try not to think of it that way because it’s delicious and will surely appear on your table more than once on a trip to Albania. Yogurt is a staple of Albanian cuisine. Whether sweet or savory, in casseroles or in dips, it makes an appearance at many meals. 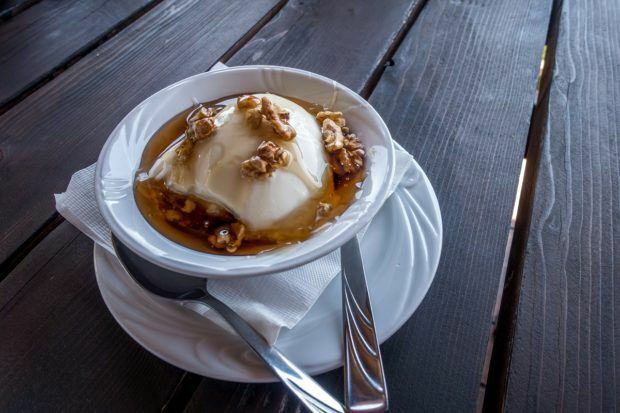 The best yogurt we had on our trip to Albania was sheep’s yogurt topped with local honey and walnuts (kos mjalte dhe arra). I’d never tried sheep’s yogurt and I’m not a big fan of walnuts, but the combination of the ingredients was one of the most delicious things ever. One of our friends spent the rest of the trip trying to recreate it for breakfast every morning. Albanians love their grilled meat. 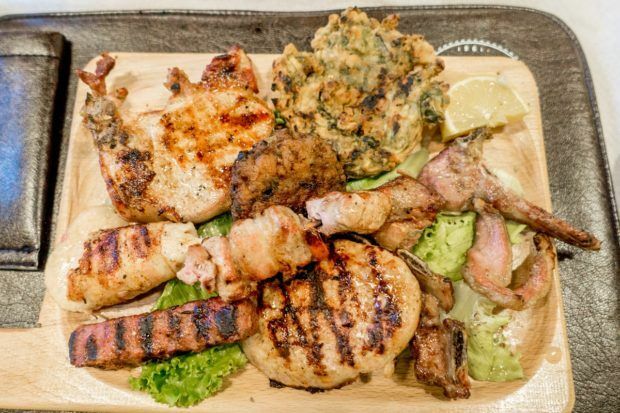 If you’re a meat eater, the good news is that most anything is available expertly grilled whether in a restaurant or as street food. Tirana even has a whole street of grill restaurants. One of our favorite discoveries was pljeskavica, a grilled, spiced meat patty made of pork and beef (and sometimes cheese), which is similar to a hamburger. A traditional food in the Balkans, sallatë shope has different names in Bulgaria, Croatia, and other nearby countries. A simple salad, it is made of tomatoes, cucumbers, onions, peppers, and parsley. The vegetables are salted and tossed with sunflower oil and vinegar. It’s all topped with a sinful amount of shredded sirene, a white brine cheese. Meatballs, called qofta, are also a popular Albanian food. As in other cultures, they are essentially meat mixed with a variety of spices and sometimes include additions like rice or bulgur. Most often, we saw beef or lamb versions of qofta and even once came across vegetarian qofta made with potatoes, onions, peppers, and egg in place of the meat. 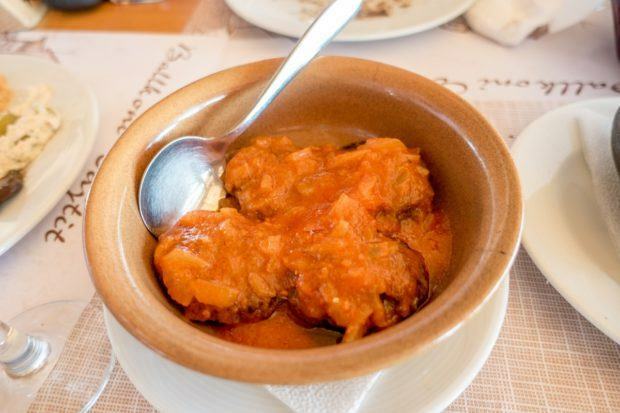 One of Lance’s favorites was qofta korca, a veal meatball dish topped with a tomato and onion sauce. 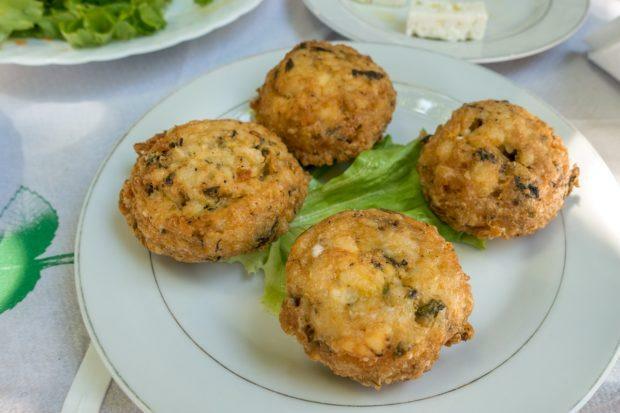 A specialty of Gjirokastra, Albania, qifqi are rice balls flavored with herbs and bound together with eggs. They were a tasty vegetarian addition to our lunch in the UNESCO World Heritage city. Hold onto your hats, folks. Rakia is some strong stuff. The national drink of Albania, this fruit brandy is often home brewed or brewed in-house at restaurants, and it is high octane. You won’t make it far without being offered a taste. 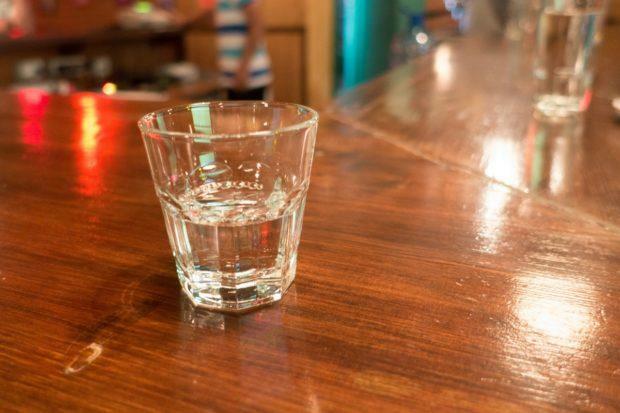 Because rakia (also called raki) varies from place to place, some offerings are better than others, but it’s worth a try. The most common flavors we found were grape, plum, and apricot, but since it’s 40% ABV, you really don’t taste much. 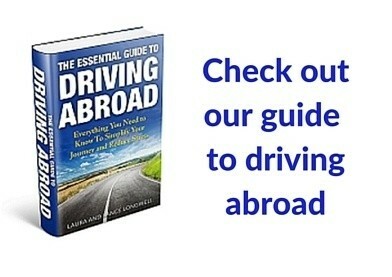 We visited Albania as guests of JayWay Travel. All opinions of the cheesy and grilled are our own. What do you think about What is Albanian Food, Anyway?? It all looks so yummy! I can definitely see the mediterranean influence there. 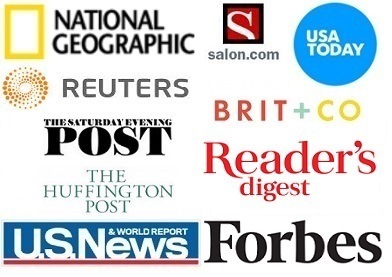 Thanks for sharing these! I am Albanian and Greek and have grown up eating this food the best. Agreed, Karen! We loved it.